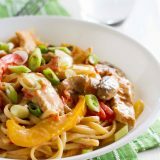 Filled with vegetables and a good kick of spice, you will never guess that this Cajun Chicken Pasta is actually a lighter meal!! Combine the milk, flour and cream cheese in a blender and process until smooth. Set aside. Bring a large pot of salted water to a boil. Cook the pasta according to the package directions. Drain and set aside. Season the chicken with 1 teaspoon of the Cajun seasoning, 1/2 teaspoon of the garlic powder and 1/4 teaspoon of salt. Heat a large nonstick skillet over medium-high heat. Spray with nonstick cooking spray and add half of the chicken. Cook the chicken until browned and cooked through, about 3 minutes per side. Transfer to a plate and cook the second half of the chicken, then remove the cooked chicken to the plate. Add the olive oil to the skillet, reducing the heat to medium. Add the bell peppers, onion, and garlic and cook, stirring constantly, until almost tender, 3-4 minutes. Add the mushrooms and the tomatoes and continue to cook another 3 to 4 minutes. Season the vegetables with the remaining 1/2 teaspoon garlic powder, 1/2 teaspoon salt and the black pepper. Reduce the heat to medium-low and add the chicken broth and the cream cheese slurry. Cook, stirring constantly, until it begins to thicken, about 2 minutes. Add the chicken strips back to the skillet. Season with another 1/8 teaspoon of salt and the remaining 1/4 teaspoon Cajun seasoning, or add more to taste. Cook until heated through. Add the linguine and toss to coat. Divide the pasta between 5 serving plates and sprinkle with the green onions.